For many reef keepers the onset of hot, humid weather during the Summer months brings with a particular set of problems. Heat and humidity coupled with the heat generated by the intense lighting and water circulation pumps can easily drive the water temperature in a reef tank to dangerously high levels. I consider a temperature level of 84 F sustained for more than a few days to be problematic, especially with a reef tank that has marginal gas exchange due to inadequate circulation. The higher the temperature the less oxygen the water can hold. 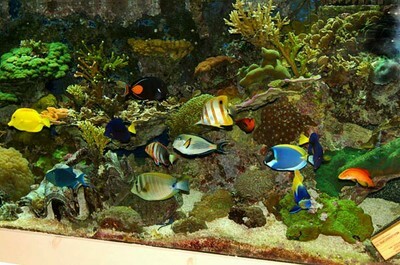 A recent photograph of a section of the Editor’s reef tank. In the first paragraph I mentioned summer heat along with humidity, because many reef keepers – me included – use either fans positioned above the tank’s water surface or directed at the water surface of the sump to cool the tank’s temperature. The use of fans this way is quite effective, but with one serious caveat: cooling is accomplished via evaporation, but evaporation is significantly diminished by relatively high ambient humidity. Fortunately, during a heat wave, there are things that the aquarist can do, without having to resort to the expense of a chiller or area air conditioner. If the heat wave lasts for only a few days, it’s both safe and harmless to photosynthetic corals to shorten the photo period, only use a few lights, or only illuminate the tank at night when the ambient temperature is lower. In fact, I know of several reef keepers who, in order to reduce their electrical bill, illuminate their reef tank only five days out of seven, and have had no adverse effects. In the wild, the sun doesn’t significantly penetrate the clouds every day, and there are tropical storms that reduce the water’s clarity, thereby preventing sunlight from reaching wild coral’s photosynthetic algae (zooxanthellae). It’s better to do without intense lighting for a few days than to risk your animals to dangerously high temperatures.